Penn Manor’s boys volleyball team has teamed up with Warwick’s boys volleyball team to raise money to dig wells in Haiti. 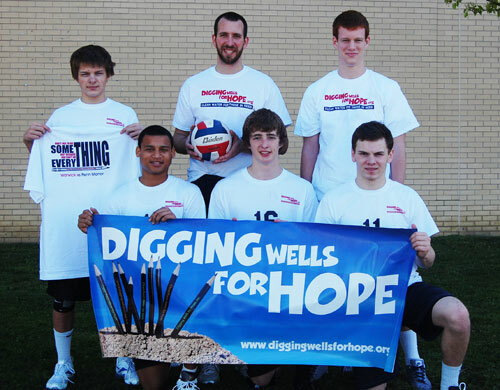 On April 24, the team will be holding “Digging Wells for Hope” matches between Warwick and Penn Manor at Penn Manor High School. A “dig” is a defensive play that allows that team to save a point and possibly win a point. Players will be asking for pledges per dig or accepting flat donations. In addition, during lunches at the high school and both middle schools, students will be selling “Digging Wells for Hope” pencils. T-shirts will also be sold. Anyone purchasing a “Digging Wells” t-shirt will get into the game for free. Boys volleyball players from both schools will be selling the shirts, but they can also be purchased at the door of these matches. For more information on “Digging Wells for Hope,” please contact Chris Telesco at chris.telesco@pennmanor.net.